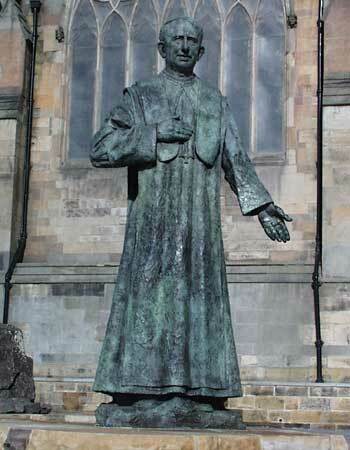 The statue of Cardinal George 'Basil' Hume outside St. Mary's Cathedral. Location: Neville Street, Newcastle. Materials: Bronze. The statue of Cardinal Hume was unweiled by Queen Elizabeth II on May 7th 2002 in the year of Her Majesty's Golden Jubilee. The tree metre sculpture shows Cardinal Hume in his Benedictine monk's habit wearing a cardinal's skull cap and the cross of St. Cuthbert.. The statue is set in a garden that reflects his love of the holy landscape of Northumbria and of the Northern Saints and stands on a sandstone platform in the shape of Holy Island (Lindisfarne).